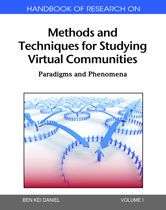 Handbook of Research on Methods and Techniques for Studying Virtual Communities: Paradigms and Phenomena satisfies the need for methodological consideration and tools for data collection, analysis and presentation in virtual communities. Chapters cover studies on various types of virtual communities, making this reference a comprehensive source of research for those in the social sciences and humanities. Additionally, the book supports executives and corporate leaders concerned with the management of expertise, social capital, competence knowledge, and information and organizational development in different types of virtual communities and environments.